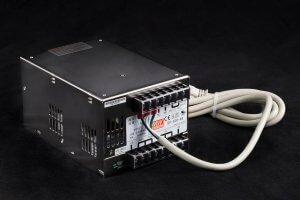 Features: This cooler is powered by 48 VDC and is rated to maintain the enclosure’s NEMA 4 rating. 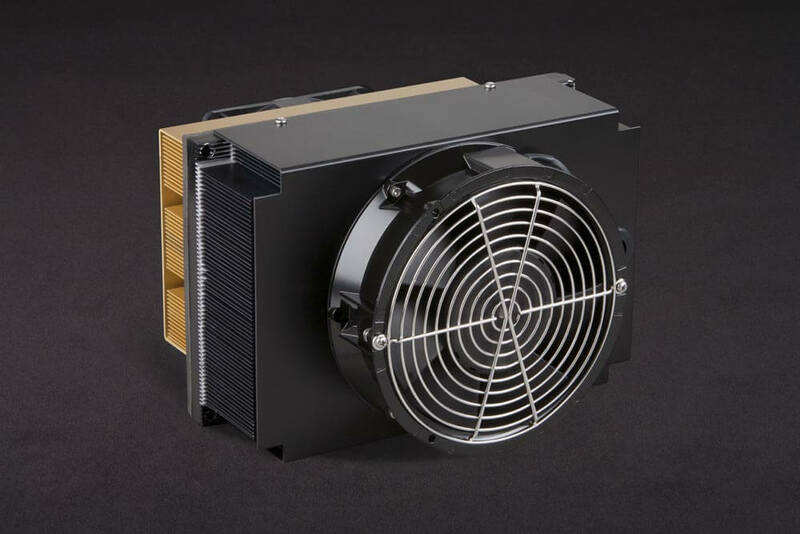 The hot-side fan is sealed against moisture, and the heat sink uses marine-grade anodizing to prevent corrosion. Finger guards and mounting hardware are stainless steel. The input wires are routed on the cold side of the cooler, making it easy to power via wiring from inside the enclosure although care should be taken so that condensation is not allowed to form on the cold sink. Can be used for heating and cooling. 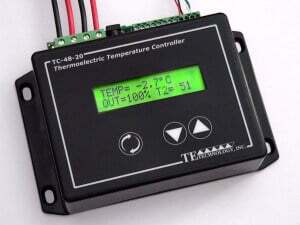 It is compatible with the TC-48-20 series temperature controllers. • Meets NEMA 4 and IP68 (fan) specifications. • Protected against harsh environments. • Stainless steel mounting hardware and finger guards. • All wiring is accessible from inside the enclosure. • Can be used for heating and cooling (requires heat/cool controller). • Cools 45 °C below ambient in a 25 °C environment. • Compact, bonded-fin heat sink and cold sink for minimum size and maximum cooling. 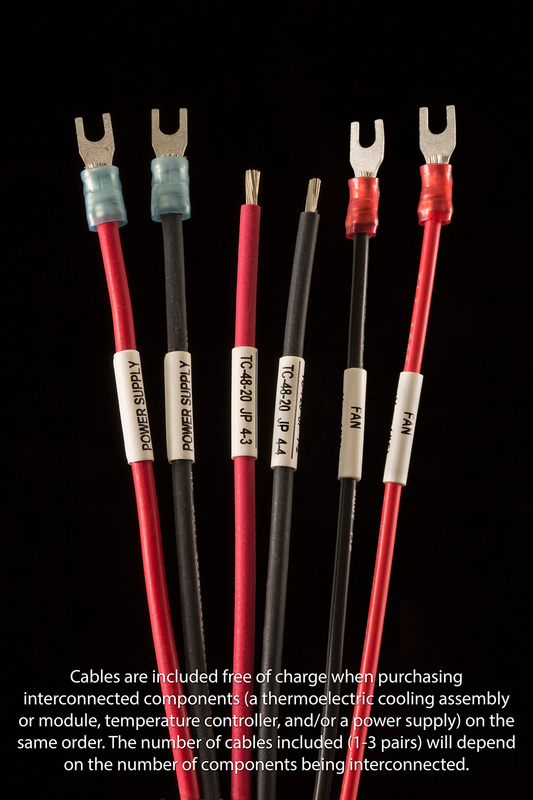 • CE marked and RoHS compliant. 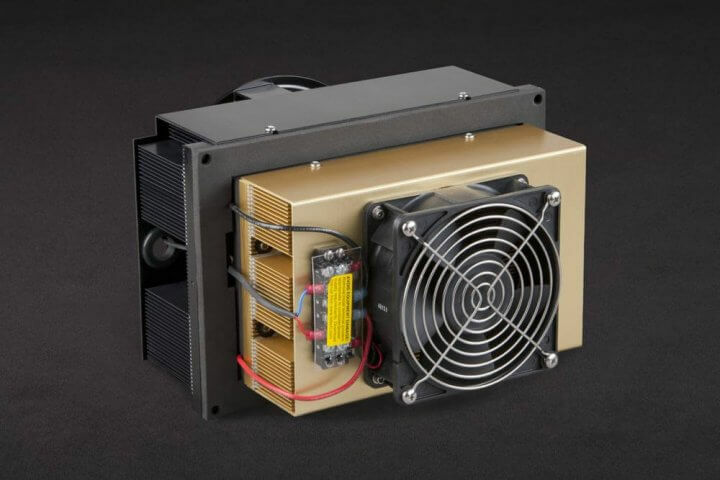 This cooler is powered by 48 VDC and is rated to maintain the enclosure’s NEMA 4 rating. The hot-side fan is sealed against moisture, and the heat sink uses marine-grade anodizing to prevent corrosion. The input wires are routed on the cold side of the cooler, making it easy to power via wiring from inside the enclosure although care should be taken so that condensation is not allowed to form on the cold sink. 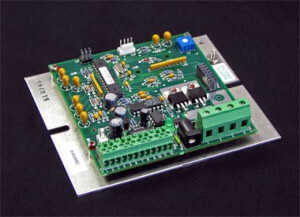 Compatible with the TC-48-20 series controllers. 3D PDF MODEL: Click on the link above to download a 3D solid model in portable document format (PDF). This must be opened in the Adobe Reader (or Acrobat) version 8 or higher. It WILL NOT WORK IF OPENED IN A BROWSER WINDOW. You can rotate and view the cooler from any angle (however, wire leads are not shown in the model). 3D content may initially appear as a two-dimensional preview image. Clicking the 3D model with the Hand or Select tool enables (or activates) the model and opens the 3D toolbar.